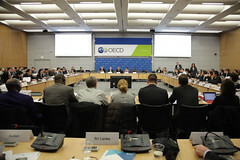 04/03/2016 - On 1-3 March 2016, the OECD hosted two important events for the international tax community. The Task Force on Tax and Development and the Global Forum on Transfer Pricing gathered over 230 participants representing 84 jurisdictions and 11 international and regional organisations. The Task Force on Tax and Development was held on 1 March 2016, and brought together over 180 participants from government, international and regional organisations, business and civil society. The meeting witnessed valuable discussions about the new inclusive framework for BEPS implementation to ensure it meets the needs of developing countries. Participants welcomed the inclusive framework. Mr. Didier Cornillet, CREDAF Secretary General, underlined the importance for developing countries to get on board in order to shape the design of the international standards. Davit Chitaishvili, Advisor to the Georgia Revenue Service, indicated the benefits his country enjoys from a closer co-operation with other states within the Committee on Fiscal Affairs. The meeting also addressed the capacity building activities currently being undertaken including the Tax programme and the commitments derived from the Addis Tax Initiative launched at the Financing for Development summit held in Ethiopia in July 2015. The work being jointly performed by international organisations on toolkits to address difficulties in accessing comparables data and on developing transfer pricing documentation requirements in developing countries was also presented and widely discussed. An overview of the main contents of the discussions at the Task Force on Tax and Development meeting is available in the co-chairs' statement of outcomes. The 5th Global Forum on Transfer Pricing took place on 2-3 March 2016, with the active participation of more than 220 senior government tax officials and representatives from international and regional organisations. Mr. Pascal Saint-Amans, Director of the OECD Centre for Tax Policy and Administration, invited all countries and jurisdictions willing to commit and to implement the BEPS package to join the new inclusive framework recently launched. He stressed the importance of ensuring an effective and consistent implementation of the guidance developed under the BEPS and the key role the inclusive framework would play in achieving this objective. He welcomed the overwhelming participation at this year's Global Forum, which he thought could be a preview of the future Working Party No. 6 on the Taxation of Multilateral Enterprises under the new inclusive framework. While last year's Global Forum explored solutions to base erosion and profit shifting, the programme for this year focused primarily on the practical impact of the revisions to the Transfer Pricing Guidelines and the challenges of implementing the transfer pricing measures resulting from the BEPS Project. In particular, through a mix of presentations and a detailed case study, participants put into practice the new framework for analysing risk for transfer pricing purposes, focusing on hard-to-value intangibles and low value-adding intragroup services. The performance of benchmarking analysis, as well as the importance and future work on risk assessment were also addressed. For media enquiries, please contact Pascal Saint-Amans, Director of OECD’s Centre for Tax Policy and Administration (+ 33 1 45 24 91 08).